Material:premium quality synthetic leather and durable Zipper. Structure:3 large compartments,8 cards and 1 ID windows slots,2 medium size pockets and 1 zipped pocket inside. 1.Please allow 1-2 cm differences due to manual measurement. Made with premium quality synthetic leather and durable Zipper,it feels soft and comfortable. Multifunctional and Spacious :3 large compartments;8 credit cards and 1 ID window slot;2 medium size pockets and 1 zipped pocket inside.This wallet is a good cards and small things holder to keep your Cash,Credit Card,Coins,Passport and Checkbook,Ticket, License, Receipts, Coupon or others.It is convenient and suitable for daily life. 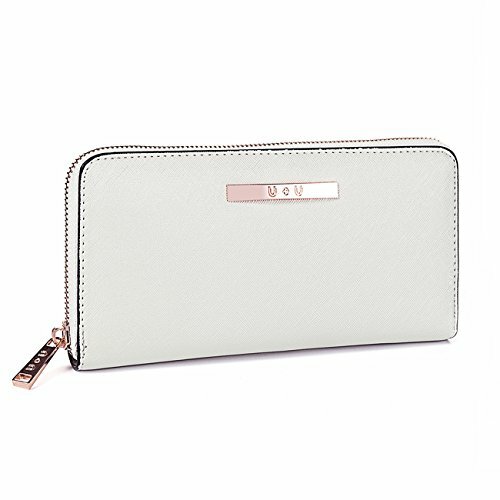 Large Capacity:8.6x4.3x0.9 inches.Your mobilephone can be fit into the purse including iPhone series of product and any phone that in a similar or smaller size.It's suitable size to hold it on hand or put it in your handbag. GIFT BOX PACKING:Comes with a beautiful and exclusive U+U logo gift box,it is a special gift for yourself or your female friends,such as Birthdays,Anniversaries,Mother' Day,Thanksgiving,Christmas and oter holidays or Special Occasions. 100% Satisfaction Guarantee:If you have any question with our product,we offer full refund or a free replacement,whichever you prefer. If you have any questions about this product by U+U, contact us by completing and submitting the form below. If you are looking for a specif part number, please include it with your message.